Mayhem is coming. Every Monday morning I can count on him like clockwork. The definition of mayhem is the random or deliberate violence or damage. 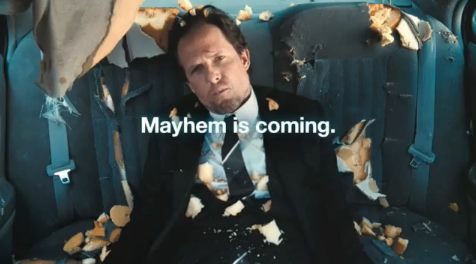 Mayhem is the guy we see in TV commercial wreaking havoc in any way he can. But mayhem isn’t just the spokesperson for accident insurance or a heavy metal band full of angst and blood; it’s the little nagging apprehension crowding the edges of our clear head. It whispers to us every Monday morning even before we get out of bed. The phenomenon is so real songs have been written about it. Do you remember the lyrics for Manic Monday? Early Monday morning I start making a list of what I’d like to accomplish during the week and this is where the second definition of mayhem comes into play: a state of rowdy disorder. Indie authors have so many tasks to do ourselves it’s easy to let them overwhelm us. We always have writing or editing or responding to interview questions. There’s research and marketing and Tweeting and Facebooking and trying to keep out fingers pounding away on those keyboards. With so many responsibilities many of us lose track of why we became writers, in all the commotion of trying to reach our audience sometimes we lose sight of our ultimate goal of being great story tellers and creating books that both entertain and touch other people’s lives. I deal with my Monday morning mayhem by making lists, creating a plan and doing my best to check off items one at a time. But, I also give myself little latitude, as a matter of fact, a latte and a little latitude is just the way to deal with the chaos of Monday. And kissin’ Valentino by a crystal blue Italian stream might work too! Happy Monday, reading and writing.